Sipping on coffee with milk on a sunny morning at the Four Seasons, Pattinson describes attempts to housebreak the “German shepherdy-mix” he recently adopted from a shelter in Louisiana. “He’s called Bear,” Pattinson says matter-of-factly. Clad in a plaid button-down and jeans, and minus screaming fans, paparazzi, managers and studio minders, Pattinson lets go of his shyness in the time it takes to recap an “unbearably irritating” game of Words With Friends. It’s only in front of a video camera later that he noticeably shrinks, adopting a hunch that matches his quick-to-draw sheepish grin. But one-on-one, conversation spins like cotton candy as Pattinson, 24, discusses hanging up his trademark vampire fangs for the 1930s-set Big Top world of Water for Elephants, a movie he calls “definitely bigger” than any other he has done outside the Twilight franchise. 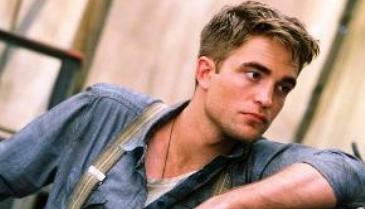 In Water for Elephants, which hits theaters Friday and is based on the best-selling book by Sara Gruen, Pattinson plays Jacob, a veterinary student who abandons his studies and jumps aboard a steam train for the Benzini Bros. roughshod circus. Jacob quickly falls for star performer Marlena (Reese Witherspoon), who is trapped in a marriage with the circus owner (Christoph Waltz). Blame it all on the selling power of an gentle giant named Tai. Director Francis Lawrence (I Am Legend) banked on Pattinson’s love of animals to sell him on the script. “The first time I met (Lawrence), we went to meet Tai the elephant at her house,” says Pattinson of the 42-year-old elephant who plays lumbering Rosie, the Benzini Bros. main act. Tai showed off tricks the studio originally thought could be accomplished only by a computer-generated elephant. The love triangle complete, Pattinson, Witherspoon and Waltz headed for Piru, Calif., where the desert set was bursting with circus tents, steam trains, hundreds of extras, spangled costumes, circus performers and animals. “There was something about the ruggedness of it, which I hadn’t really done,” Pattinson says. And there were distractions. Witherspoon, who occasionally brought her kids to the zoolike set, laughs as she talks about Tai following Pattinson “sort of like man’s best friend — even though she’s 9,000 pounds.” Pattinson recounts “insane” days, including one when the script finds Waltz taunting Pattinson to hand-feed a hungry lion. Pattinson opens the cage, and the lion pounces. Scarier still was the scene where Pattinson is knocked down by a stallion. “That was terrifying,” says the actor, who admits to a fear of horses. In Elephants, Pattinson’s name receives equal billing with Witherspoon and Waltz, a nod to his international success with filmgoers. Yet this is not the first time Pattinson has worked with Witherspoon; seven years (and a pop-culture lifetime) ago, Pattinson was an unknown fresh from the U.K. who scored a role as Witherspoon’s, uh, son in 2004’s Vanity Fair. His role ended up on the cutting-room floor. “He was very young, like 17 or 18,” says Witherspoon, who describes him today as “very quiet and introverted” and uninterested in fame. As The Twilight Saga comes to a close with the two-part feature Breaking Dawn (based on the last book in the Stephenie Meyer series), the question looms as to whether the public is willing to pay to see Pattinson play anyone besides vampire Edward Cullen. Especially as those films continue to make money. The Twilight films, including New Moon and Eclipse, have made more than $1.8 billion worldwide. In his months off, Pattinson began to expand his résumé, first with last year’s romantic drama Remember Me. Summit Entertainment is releasing Breaking Dawn, Part 1 this November, but Part 2 will not be released until November 2012. Meaning, no matter what other projects Pattinson takes on, the fandom and furor that surround the franchise are Pattinson’s to keep until roughly early 2013. Would he do a franchise again? “Only if I could have a lot of say in the development of it,” he replies, noting the “if it ain’t broke, don’t fix it” creative mentality of the series. The spotlight is just as hotly focused on Pattinson’s relationship with girlfriend and Twilight series co-star Kristen Stewart, 21. “I try my best to avoid it happening by never being seen or not saying anything stupid in interviews, but it doesn’t seem to matter,” he says of the rumors and headlines about them. But his Elephants co-star says his life is more normal than it looks. “He’s very much a 24-year-old guy who has a girlfriend and is enjoying himself and his friends,” Witherspoon says. It’s hard to convince the fans of that: When paparazzi caught Pattinson kissing Stewart last week after the Elephants premiere, the blogosphere exploded. “I just don’t like it,” Pattinson says; the rabid attention has forced him to unload his L.A. home and instead live out of hotels. “That’s not part of my job. It’s embarrassing, people using your life as entertainment. Cue his explosively hot career. “You’ve just got to remember why you’re doing it in the first place — which is quite hard sometimes,” he says, chatting about his next projects, Cosmopolis with Paul Giamatti, “a departure from everything I’ve done,” and period piece Bel Ami, which has no release date set. And so the circus, aided by a bit of technology, must go on. Breaking Dawn vampire Nikki Reed is one of the few people who have checked out the script for the upcoming “Twilight Saga” installment. And as the starlet tells it, the big wigs behind the flick are trying hard to keep it that way. When MTV News chatted with Reed on the Scream Awards red carpet Saturday, she said the script is guarded so carefully that even well-known industry professionals have to jump through hoops to get a peek. It appears that studio execs are keeping such a close eye on the script for good reason, as Reed said filmmakers have knocked a great screenplay. The actress said she is ready to tackle the script head-on as production gets underway for the 2011 release, and is amped to work with the flick’s acclaimed director. As Reed continues to ride out her role as Rosalie in the “Twilight” series, the actress reflected on the experience so far and said she’s satisfied with her contribution to the onscreen phenomenon. “If it all ends tomorrow for me I’m happy because I feel like I’ve been a part of things that I’m really proud of [and] that I’m really grateful for,” she said. In the interview Jackson discusses the Breaking Dawn script saying that how “Renesmee was made” is in the script!! He also talks about where Breaking Dawn Part 1 will end, asking the fan sites where they think it should be.